Note: Forgive spelling errors. I am typing this into my iPad and it sometimes makes incorrect 'corrections'! The weather was STUNNING today--70 degrees out and plenty of sunshine as we circled the Sea of Galilee. The schedule: Chorazim, the Mount of Beatitudes, Capernaum, Tabgha (site of Peter's confession), and then Kibbutz Ginosar to see the first century fishing boat and then take the boat ride across the Sea of Galilee to Tiberias. I was a little concerned about that boat ride, and I was thinking "Minnehaha" like the boat ride in Lake George, but as God will do, it was blessed and a blessing to all of us, cementing bonds of friendship and fellowship. But more in a bit. A typical breakfast here is vegetables and handmade cheeses, feta, goat and fresh white cheeses. The vegetables are served with 'cream cheese' on the side, which is more like yogurt, or they have olive oil dressings with herbs. There's no cereal, but there is an espresso machine in every dining room so far, so I begin with a double shot every morning---ahhhh! We headed out to our day of travel, passing the tomb of Rachel, and driving through Migda, also called Magdala, home of Mary Magdalene. At Chorazim we walked through the ruins of a first century synagogue, the only one we know Jesus walked and taught in. Humbling and beautiful. We also visited the Mt. Of Beatitudes, where Jesus spoke his famous Sermon on the Mount. Yes, it is now built up into a tourist exhibit to some extent, but as Bp Neil said, "in a world that is becoming increasingly more irreverent, it is good that someone has preserved place to be reverent." The Catholic Church has maintained rules of silence and prayer in these places, even as churches and buildings have been placed close to important sites. If they had not done this , it is conceivable that these sites would be lost forever. Bp Neil let us have some reflection time with the Beatitudes and told us that if we truly intend to be followers of Jesus, that we need to expect discomfort, stress and challenge. If we want to impact the world for the kingdom of God, we will be turning cultural expectations upside down, and we will have difficulty. Sobering words. Certainly words which describe Jesus' life and ministry. One more brief story before I need to go to bed--we are all exhausted. 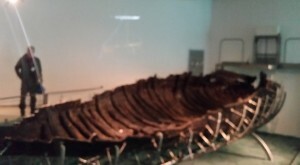 The Jesus Boat. The Sea was still as glass and a haze hung over the surface of the water--Jesus did not have to calm the storm, thank God! The crew of the wooden boat, with all 28 of us aboard, hung the flags of the three different countries represented--US, Canada and Kenya. Then they played each of our anthems, and the people from these countries stood and sang. Most moving was when Bp. John Ochiel from Kenya stood alone and sang with great emotion as the Kenyan anthem played. We became aware of God's call to his people around the world to be one family. Even more moving was when we asked the crew to play the Israeli anthem for themselves, and the haunting and mournful sound of that song played as the crew stood and sang together. As the sun was setting, and this beautiful music played, a flock of doves came swooping over the boat and I imagined God telling us "These are my people, my beloved. In them I am well-pleased." 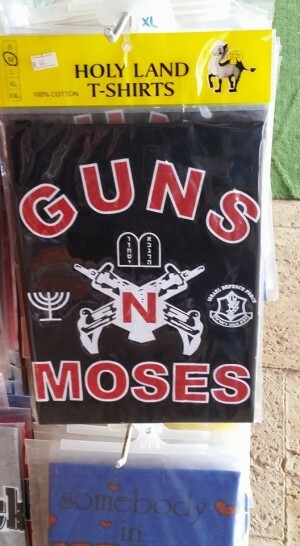 We have so much to learn from our Jewish brothers and sisters. And then, time to clear the deck for dancing! Israeli folk music played as we joined hands and gathered in two concentric circles, moving slowly at first, and then faster. I can't explain how that rare moment affected me, but I danced with tears in my eyes, and laughter in my heart. Dancing on the Sea of Galilee--who would have thought? Our day came to a close with a talk from a local Messianic Jew (our guide is also a Messianic Jew)--Jews who believe that Jesus is the Messiah. There are only 12,000 in all of Israel (pop 8 million) , and their faith is often tested and they are persecuted, but this young man had so much joy in talking about the way his faith became stronger as the persecution against his family increased. He learned how to defend, explain and translate his beliefs for people, and it is a skill we should all be prepared to develop. What good is a private faith, a private salvation? Jesus risked everything, shared everything, that we might know him today, and share his exceedingly Good News. The only reason I was dancing today is that Jesus called me to visit his homeland, the homeland of OUR faith. I would like to think that the circle of dancers I found so moving would radically increase as we invite ever more people into the circle of love and blessing, of challenge and discomfort, of invitation and transformation, that Jesus himself experienced, a circle of love which gives us strength to reach out to others, tightly holding hands with strangers who are our brothers and sisters. Remember the famous line the Archbishop of Canterbury told me:"Hope is hearing the music of the future. Faith is dancing to it today." Can you hear it? Will you dance? 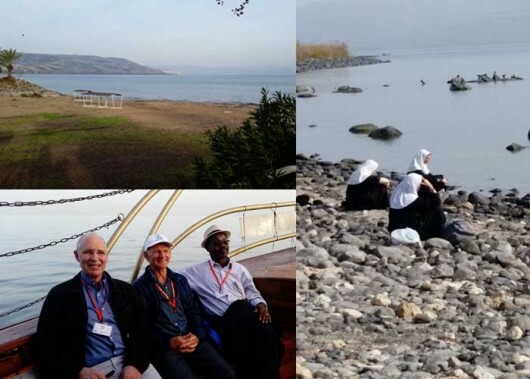 (Top Right) Three nuns praying on the shores of Galilee near the Church of St. Peter. I imagine it may have looked like this in the time of Jesus when the women gathered to pray in the mornings. Day 2 - Thanks Be To God! When someone says "Good Morning; how are you?" 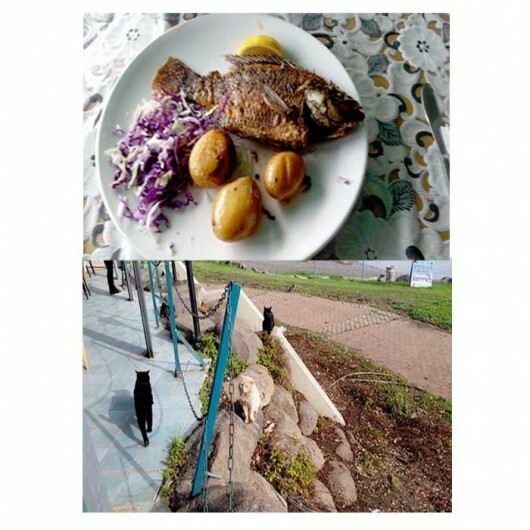 in Israel, it is bad manners to say "Really good!" or even, "Terrible." The proper response is "Thanks be to God!" Because they are indicating that in ALL circumstances, we should be giving God praise first. He is always faithful; He is always good. I find that a very powerful example of faith in action, and my day has been a series of faithful and extraordinary moments of thanksgiving. 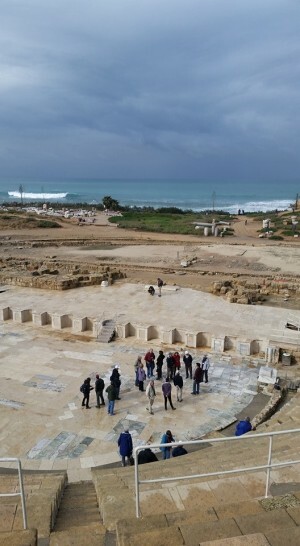 First stop--Caesarea Maritima--Herod's magnificent harbor city, now in ruins, but excavated so that we could see the original amphitheater and hippodrome, where chariot races were held. It was also the place from which Paul would have left on his missionary journeys. Then to Mt. Carmel, where the prophet Elijah challenged the prophets of Baal. After that we went to Megiddo (also known as Armageddon--yep, THAT Armageddon! ), and then to the busy city of Nazareth, which has nearly 200,000 inhabitants now, far more that the 200 or 300 when Jesus lived there. But we went to the Church of the Annunciation, which is believed to be built over the house where Mary and her family lived (which we saw parts of), and is close to the place where the Angel Gabriel made his announcement (annunciation) to Mary. We also saw the site where Joseph was believed to have been buried, in a tomb much like the one Jesus was buried in, with a stone that rolls across the opening. Apparently this kind of tomb (with the stone that is rolled across the opening) was unusual, and only a few still exist in the entire country. The food here is so good, at least to me! 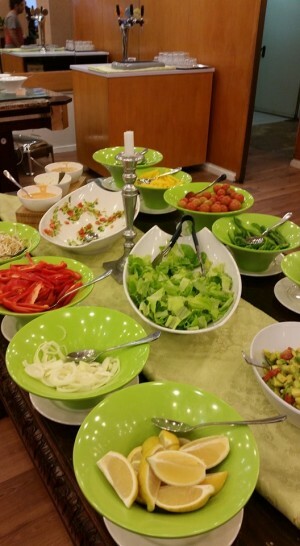 Lots of fresh vegetables at every meal, including breakfast, homemade hummus and vegetable salads, falafel with tahini--my Mediterranean blood is resonating to these lively favors and fresh foods. But it is exhausting as well, and I need to get good rest before we start all over again tomorrow. We are on the bus by 8 am each day. Tomorrow we see Chorazim, the Mount of the Beatitudes, Capernaum, Tabgha and we are taking some kind of boat ride on the Sea of Galilee. Hmmmmmm.....I'm not much of a sailor...although I love the water. In fact, just before I wrote this, I walked down by myself to put my hands into the Sea of Galilee. We got here too late to see it in the light, but I wanted to see it anyhow. As I stood at the edge of the sea, salt water dripping off my fingers and looking at the lights of the surrounding cities shimmering in the darkness, I thought, "Jesus himself stood by these shores, fished in these waters, dipped his own hands in the sea to wash them, " and then I thought "Thanks be to God!" Blessings to all. I carry you with me in my heart. A Sister of Nazareth (a good Irish nun!) 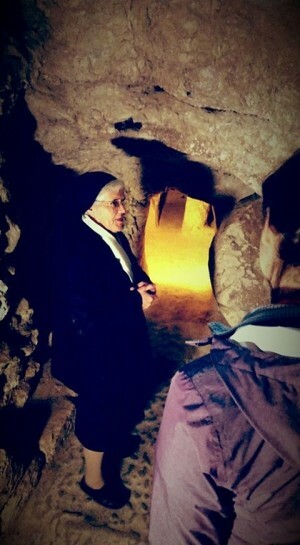 talks to us in the undercroft of the Church of the Annunciation. Behind her is the doorway to the tomb of Joseph the Just -- as in Jesus' father!! OK, I'll post some meaningful pictures too, but this is hilarious! In Herod's Amphitheater at Caesarea on the Mediterranean. Paul's missionary journeys would have started here.